Saudi-based Alkhorayef, the only Middle Eastern manufacturer of electric submersible pumps (ESPs) and horizontal pumping systems (HPS), is embarking on an ambitious programme to strengthen and extend its international footprint. The company will take its field-proven portfolio of artificial lift products and services to new markets, with a new more global Alkhorayef brand. From its origins serving the water sector in Saudi Arabia in 1980, the company quickly moved into providing ESP systems to oil and gas operators in the kingdom; expanding into Kuwait, and then across the Middle East. Providing, installing and maintaining ESPs in Oman helped establish the Alkhorayef business model as the "local" ESP provider within each region by 2002 – a blueprint that has since been rolled out overseas through projects in Africa and Latin America. Today the company has an installed base of over 6,000 ESPs and is proud to serve the industry’s most successful E&P organizations. Part of the Alkhorayef difference is the company’s dedication to maintaining the highest quality service to each of their clients. This attentive service is challenging for locally-based businesses to deliver at scale. At the same time, generalised service companies often lack an ESP focus, since they support a diverse set of oilfield technologies. Responsive service focused on ESPs is now a vital factor in the drive to reduce downtime and avoid deferred production. A network of strategically-located operational centres provides consistent access to knowledgeable personnel and regional specialists, allowing Alkhorayef to respond to requests faster, solve technical challenges sooner and bring wells back online earlier. Alkhorayef has continued to invest significantly in personnel training and in innovation – even throughout the downturn. By investing 4.5 per cent of its total revenues back into Research and Engineering (R&E) activities, Alkhorayef customers are in the best position to adapt to changing conditions, both downhole and in the market. In an era where technologies can be bought in from elsewhere and branded, a further Alkhorayef difference is that it designs and builds its own ESP systems in-house. This reflects the company’s long-held belief that exceptional performance relies on attention to detail and precision manufacturing. Built to international quality standards, components are assembled at the company’s dedicated manufacturing facilities where they also undergo rigorous quality testing. A comprehensive portfolio of ESP components – which includes pumps, variable speed drives, cables, seals, motors and gas handling equipment – will be available internationally as SPECTRUM high-performance ESP systems. In addition, ESP solutions engineered for more demanding requirements such as sour gas, deep, ultra-slim wells and high viscosity hydrocarbons will be available to customers as part of the SPECTRUM ADVANCE range. And while these ESP systems and solutions are likely to answer the majority of production requirements, there will always be projects with additional technical demands. Through its Application Engineering Services Alkhorayef responds to clients’ unique application requirements, developing innovative engineered solutions that address specific challenges. "Our engineering teams have a solid history of working with operators to tailor technologies to meet their unique application needs," a company spokesman says. Cases cited include a medium voltage variable speed drive (VSD) designed to consume less space on offshore platforms and reduce the capex required for a new offshore field development in the Middle East. 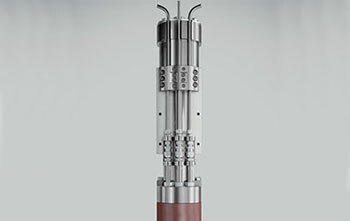 The company demonstrated its growing global presence by highlighting a recent case from Colombia where it has installed a patented double-stage gas separation system. As a result, the operator was able to restart production from a previously shut-in field. "Alkhorayef is working on a number of engineering solutions to address challenges brought to us by clients. We have several new technologies currently under development at our R&D centers that will allow operators to increase reliability and production in more challenging applications," the spokesman adds. Alkhorayef offers artificial lift, enhanced oil recovery and production facility services in 10 countries across the Middle East, Africa and Latin America.